You're going to love this recipe Pork Chop Sheet Pan Dinner, no fuss meal. Easy clean up. This tasty dinner is fit for a hungry family. Preheat oven 400 degrees. Spray sheet pan with cooking spray. In a bowl, add potatoes, carrots, add remaining ingredients except pork chops. Mix well until coated, and place on sheet pan. Season both sides of pork chop with salt and pepper. Brush remaining oil on pork chops. 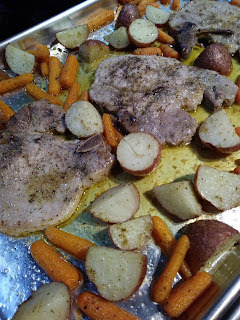 Arrange pork chops among potatoes and carrots on sheet pan. Bake 20 to 25 minutes, until pork chops, no longer pink and veggies are tender, turning pork chops halve way through cooking. Love all in one pan meals! Me too, and easy clean up. Sheet pan dinners are just the best! Sheet pan meals are awesome!